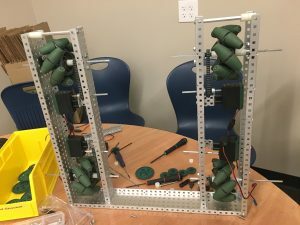 The Williston Wildcat Robotics Block Blog! Our teams are doing great work ! 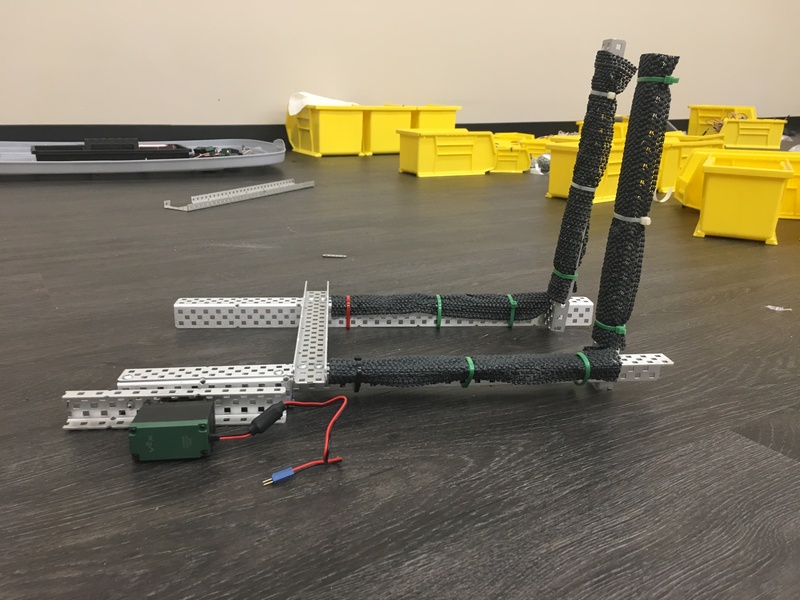 Team 3157N, under Mac’s leadership, has finished constructing the drive chassis, which is the base structure of the robot. 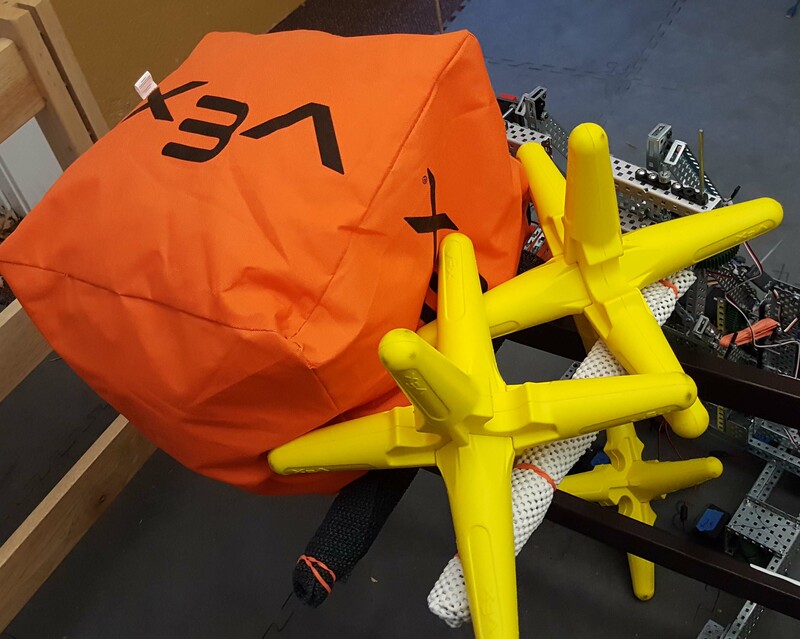 They are planning to work on lifting mechanisms in the upcoming weeks, including first designing a reversible arm and then a cascade when necessary parts arrive. On the other side of the room, Team 3157A is working on adding rubber bands to their drive chassis and finalizing their ball intake. They also started to work on coding at this very early stage of the competition. In the following week, they will finish the chassis and test the ball-intake. There are also some changes in team compositions. Rider stepped down and Ken’21, stepped up as the leader of Team 3157A. Abby becomes a member of Team Ken as well. In this way, we make both teams more balanced and more cooperative. Overall, we had some real progresses going on in the last couple weeks. Keep working Wildcat! Hello Everyone! Greetings from your favorite Robotics team, Wildcats! This is a top view of the field we are going to compete on. There are flags, caps, balls, and parking lots where we can gain points. The nine flags on the top need to be turned to the color of our assigned team (red or blue), and the upper two must be hit by a launched ball. The caps have to be stuck on top of the six sticks on the left, right and bottom. The parking lots are for robots to park at the end of the competition. The middle three parking lots are lifted from the ground, so it’s hard for robots to climb up there and not to be pushed off by opponents. This year, we will compete with two teams: 3157N lead by Jack’20 and Rider’20, and 3157A lead by Mac’20. Seniors Kohmei, Andrew and Glede will serve as coaches and overseers. Although some of the most crucial parts including motors have not come in yet, both teams worked really hard this week. We are really making good use of what we’ve got! This is a L-shaped cap-grabber designed by 3157N. It is less alignment dependent, light and easy to integrate to the whole robot. However, it is not intuitive for driver to control, meaning that we will need extra practice time, and it will make the lift to become higher than it needs to be. We still need to overcome this problem. 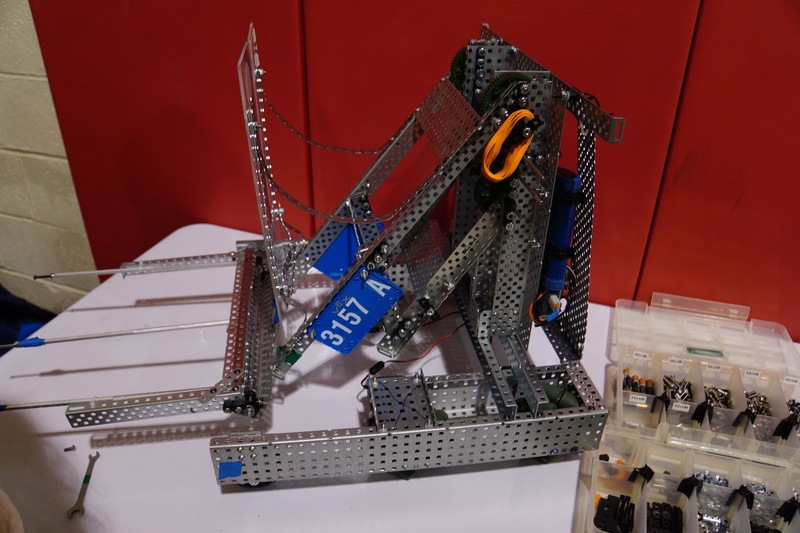 Here is a video of 3157A Team members Peter and Tee testing their ball-launcher. It can shoot 2 balls at a time. Click the green words to watch this ten-seconds click! We will keep doing mechanisms and prototype developing until the core parts arrive. Please keep following us and see our progresses! Happy New (School) Year everyone! New members this term include: Abhinil Bagde, Aaron Hammer, Kai Hori, Jillian Perry, Tee Tesharojanasup, David Li, and more to come! Today we deconstructed and organized recyclable parts from last year. Can you believe that there are so many bright minds and hands in this room? Viewers, thank you so much for your generous support! Please follow us and we will keep you in the loop! Wildcats Robotics are off for a bright future, starting today! Over the long weekend, Team N had an excellent time at a competition hosted by Ch oate. Three team members, Abby, Ken, and Mac went along with Jack from Team A, who brought an extra set of hands and scouting experience! We did well, winning 4 out of 6 matches and placing 17th overall out of 49 teams! Mac, our amazing driver, controlled one of the fastest robots there. Through moving mobile goals (cones) into point zones and playing intense defense, we were able to score highly while working with our alliances. We had a few tricky situations but Mac was able to get out of them with help from the coach, Abby, and strategist, Ken. Although we did not make it to the elimination round, we are proud of what we accomplished with a smaller team! We learned so much at the competition along with meeting some other very nice teams and grew stronger together. 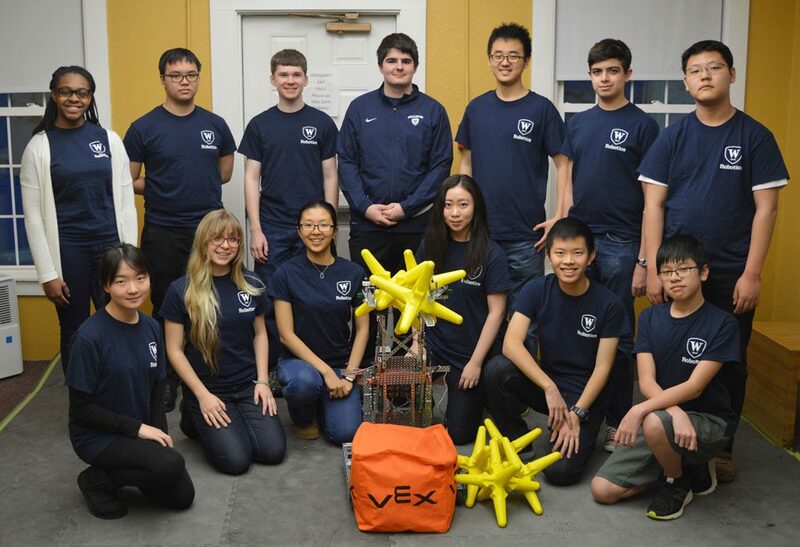 Stay tuned for an article about last Saturday’s competition where Team A was in West Haven to practice before they head to regionals on March 3rd and 4th! Team A headed for Regionals! 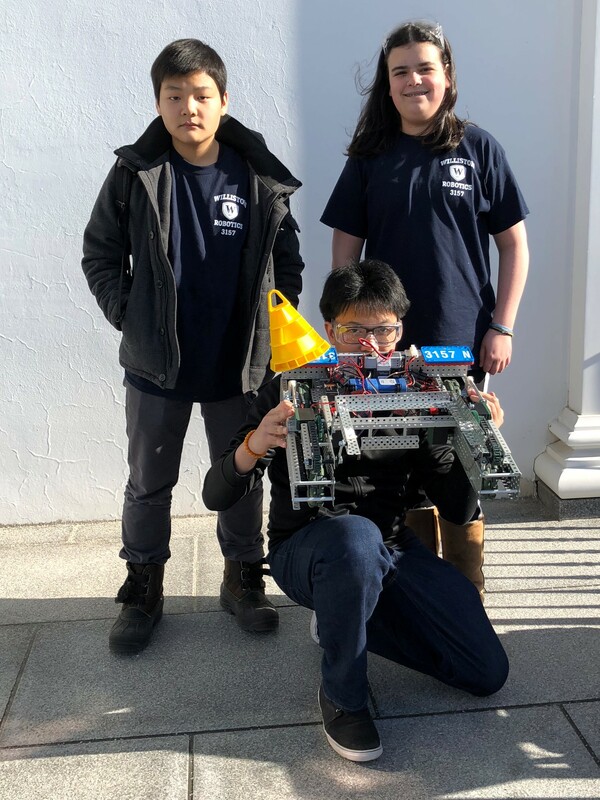 We are happy to say the A team, after the January 27th competition at North Andover, has qualified for the Southern New England Regional Competition! The competition was attended by both Team A and the newly named Team N (N for New) and we both did an amazing job. Both made it into the elimination rounds and an exciting match took place where Team A faced off against Team N! In the end, after a close battle, Team A took the victory and continued on to the final match which got them a place in the regional competition! Stay tuned for reports on future competitions and follow Team A to Regionals! 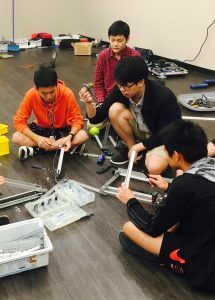 Wildcat Robotics – a team of 18 students and 2 robots have been busy for the past few months getting ready for a string of competitions. Five members of the team competed Saturday January 20th and had a great time. 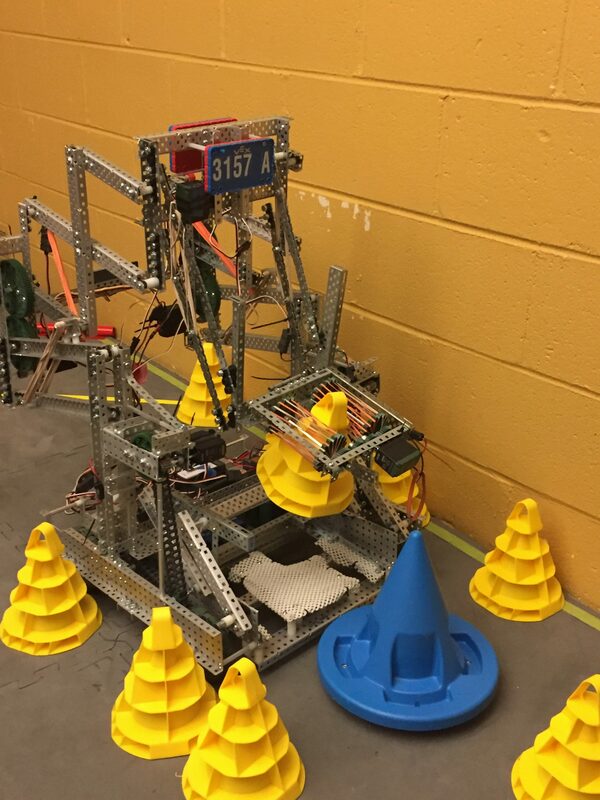 This year’s game called “In the Zone” requires robots to move cones around a playing field into various point zones. 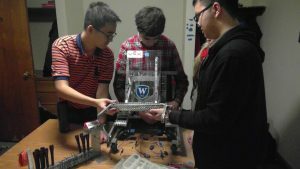 Our team brought RAMBOt for it’s first competition. We were paired with some really amazing alliances and together we completed 8 matches. At the end of it all, we had won 3 matches and came close in others. We met a lot of other teams and learned a lot of interesting things. Our driver, Mac, was able to move a few mobile goals into the zone and then play amazing defense each round. In the skills competition, he placed our robot 12th out of 27! Joined by coaches Drew, Abby, Glede, and Ken, along with Ms. Lucia, we had a great day! 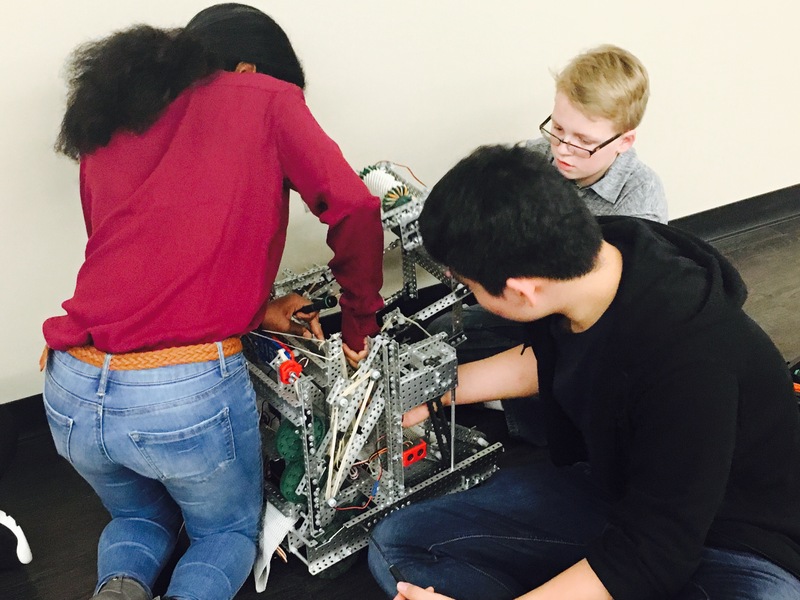 Both robots are headed for competition this Saturday January 27 and we expect great things! Stay tuned to hear more! 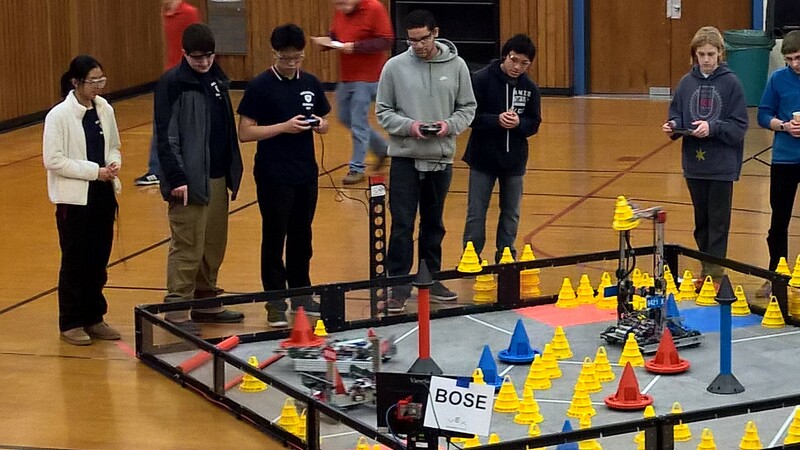 On Saturday, February 11th, we participated in a qualifying tournament at Quinsigamond Community College in Worcester, MA. 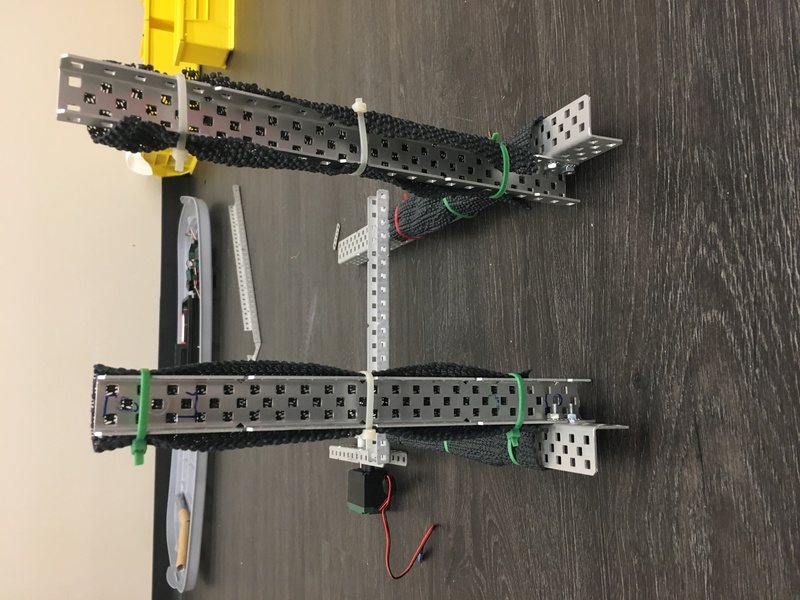 We had given our robot a complete overhaul in design following the previous tournament so we were eager to see how it would perform during competition. After observing a number of matches played by many of the robots, we realized our robot was the only one with the capability of picking up two of the orange cubes at the same time. In addition, our robot can pick up five stars when they are clumped together. 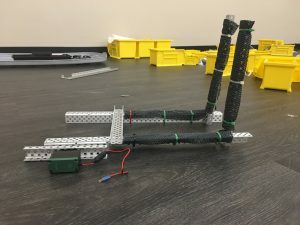 Though we were not so sure how our new robot would perform in competition, we believed our robot would do fairly well. We wanted to do well so we could experience what it would be like to be in the top tier after the qualifying rounds and to be able to choose our alliances for the elimination rounds. For our first match, our alliance partner did not show up but we still won the match. Winning the first match was encouraging and gave us hope for a successful day. The running stats showed we were in first place for a period of time. We lost only one match out of seven and even that match was very close. We were among the top ten teams out of forty nine the entire day. We were in third place at the end of the qualifying rounds. 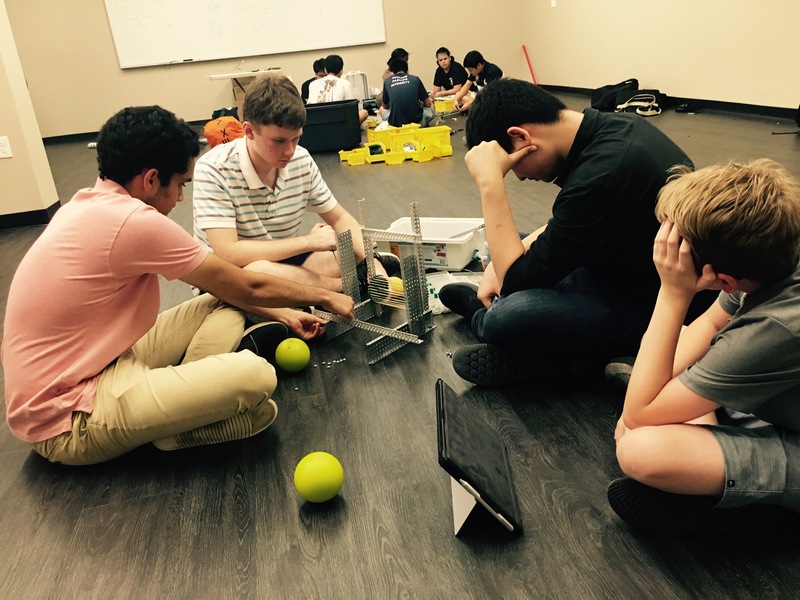 When we were not involved in a match, we spent our time interviewing the other teams to learn as much about the strengths and weaknesses of their robot. This is called “scouting” and was very helpful when it came time to choose a team to be our alliance for the elimination rounds. Not only do we learn about the other robots but we also get acquainted with members of other teams. 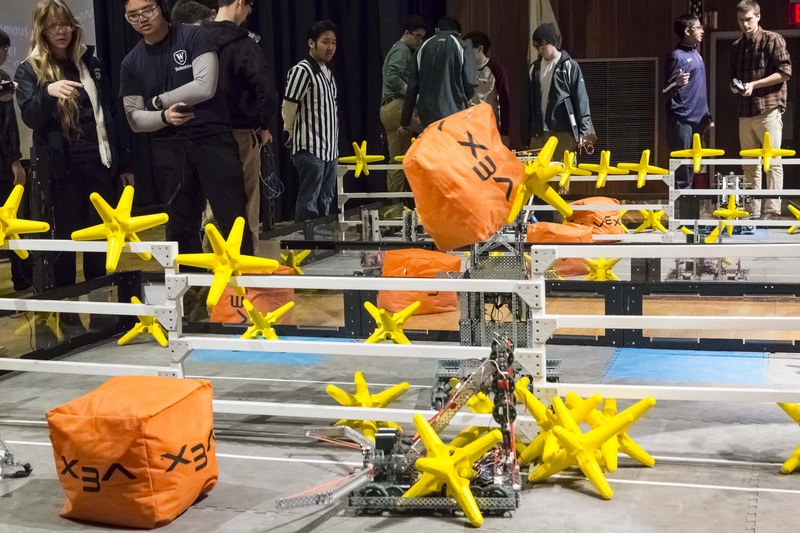 During the quarter finals, our alliance lost the first of three matches unexpectedly. We won the second match and then called a time out to adjust the programming of our autonomous program before the third match. Changing workable code without the opportunity to test it out was not a good idea. The robot jammed under the fence and was rendered useless for the remainder of the match. We learned a valuable lesson. We lost our opportunity to move on in this tournament. Now with two more weeks to revise our robot and our strategy, we have established and agreed on a clear plan to have the best robot possible ready for the Championship Tournament March 4th and 5th. Our first design (shown above) consisted of a pitchfork and backboard, which allowed us to scoop up to two stars and dump them over the fence. While this design was great for winning at the qualifiers, it felt sluggish and it couldn’t toss cubes over the fence reliably. We went through a design process and came up with Yana’s Revenge, a grabber style arm that can easily grab cubes and up to six stars. Yana’s Revenge became our main design because it was much more capable at completing the tasks. It can also clap, so that’s nice. This became our design of choice because it has a fixed bar in the middle that works with both motorized side arms. Using our controller, we can make the robot pick up as many as four stars reliably and also clap. We can also control each side arm independently, giving us improved control. Below are pictures of the new design. 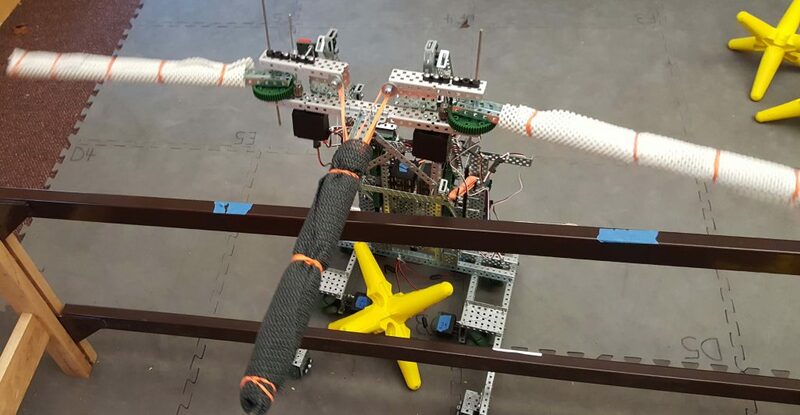 The robot after dropping the full load over the center fence. Getting ready for competition at Boston University Academy! For the next week we will be preparing for our competition at Boston University Academy. 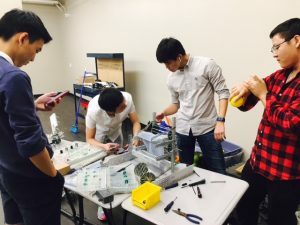 With a wonderful supply of light aluminum parts, and some minor changes to our wheel base, it will allow us to solve some major problems with our robot. We are also happy that two JV robotic members will be accompanying us. See what the challenge is all about! The Starstruck challenge is a complex challenge that we are participating in for this robotics season. See what the game is all about (Click Me) This is made by Vex robotics, the platform for our league. Our strategy with in the Starstruck challenge is base around throwing stars over as fast as possible, by use of a pitchfork arm. You can see a wonderful recording from our last competition (Click Me). 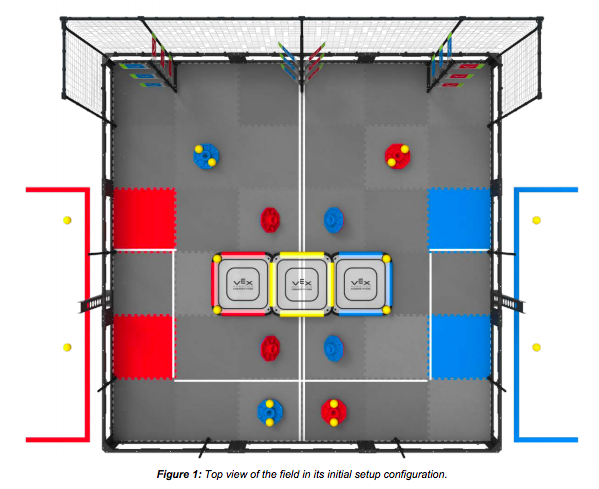 The rounds begin with an Autonomous round where the robots follow pre-programmed commands. Don’t worry if they stop for five or so seconds, because after this, the driver controlled round begins.